Home / Environment • News • Slider / It’s here: Worlds End! Doom, despair, denial, depression, IT’S THE END OF THE WORLD!!!! These are common reactions when people learn about the reality of climate change. Similarly, when people think about capitalism it can seem as though nothing can be done to change it, that it’s too big, too strong, that maybe that’s just the way the world is. But things change. Worlds end… New ones begin. Part of what prevents action on these big issues is the way people talk, think and feel about them. 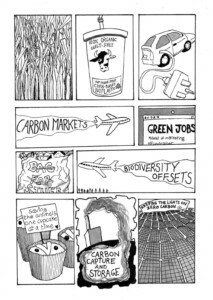 Using words and pictures, Worlds End, a new comic published by Corporate Watch, aims to help people understand climate change and capitalism and encourage a different approach, one that builds power to fight them. 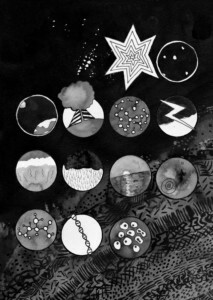 The comic tackles some of the most difficult issues relating to the global ecological crises we are faced with. It aims to be understandable and appealing to those new to the politics of climate change, but still fresh and useful to people that have spent a lifetime campaigning on the environment. A lot of time, thought and effort has gone into the comic and we really want to get it out to as many people as possible. Please send it to any relevant email lists, tell your friends, share it on social media etc. Get in touch for interviews, articles and workshops based on the comic. We welcome any feedback you might have. Let us know if you would like to write a review and we’ll send you a copy in the post. Click here to sign up to the Corporate Watch newsletter to stay up to date with our work (one or two emails a month).